The Easter holidays are always an egg-citing time for us. Not only do we have two weeks of holiday fun to look forward to but the kids get to do an Easter egg hunt and also it is my firstborn’s, Joshua’s, birthday! This year my eldest turned 6. It was actually going to be a special birthday as he had finished school on Friday. He had an operation scheduled for Tuesday 31st March and then on Saturday 4th April was his birthday. It was going to be a double birthday celebration at our house as it was Joshua’s favourite’s Uncle’s 50th birthday the following day so there was a double birthday party at ours. An operation for one of your children is always a scary thought. I was very worried, and so was he. But he coped with it really well. He was such a trooper. He was back to himself by the following day, Wednesday, and looking forward to the party which we had planned on Saturday. He did say he was worried about the operation only because he wanted it to be over quickly so he could look forward to his birthday party and eat his Mr Kipling cakes which we had been sent. Then, disaster struck! Joshua came down with chickenpox on Thursday morning. He was covered in them. Poor bubba. Which, then meant we had to cancel his birthday party. OH No!! He was devastated. Missing out on all that fun. We had planned so many games and as it was a joint party (for Joshua and his Uncle) we had to cancel TWO parties! Joshua was quite upset, but he dealt with it like a true trooper. He had started to itch quite a lot. 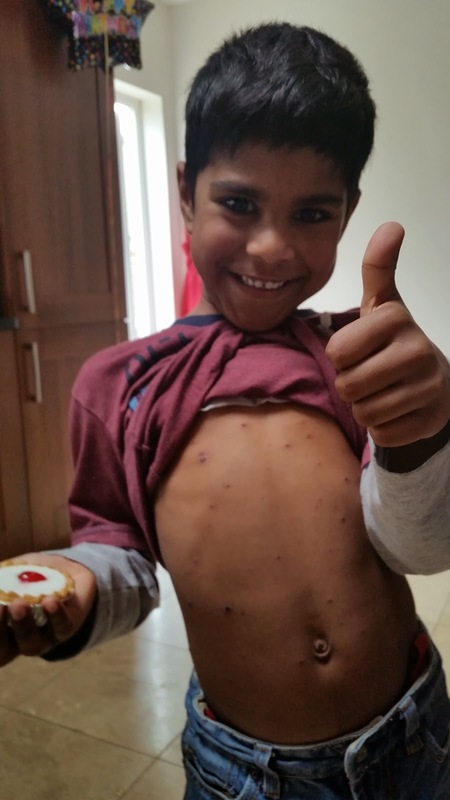 For a 6 year old he had a lot to deal with (operations, chickenpox, party being cancelled). But, on top of that he had also given up chocolate for Lent, and he had nearly done the whole period without any chocolate. But, when his itching had started he asked if he could have a chocolate treat and he was eyeing up the Mr Kipling cakes that had been delivered. Look at the smiles! A way to a boys heart is certainly through his stomach! Cake certainly makes life a lot better. #betterwithcakeI couldn’t resist and tore the packets open. Joshua was delighted and this was the first time I had seen him smile for at least 24 hours. Even though we had so much to look forward to over the Easter Holidays, which we had to cancel (Joshua’s chickenpox have finally gone down….in time for school tomorrow! ), the cake was the one thing that put a smile on my boys face. And he savoured that treat!